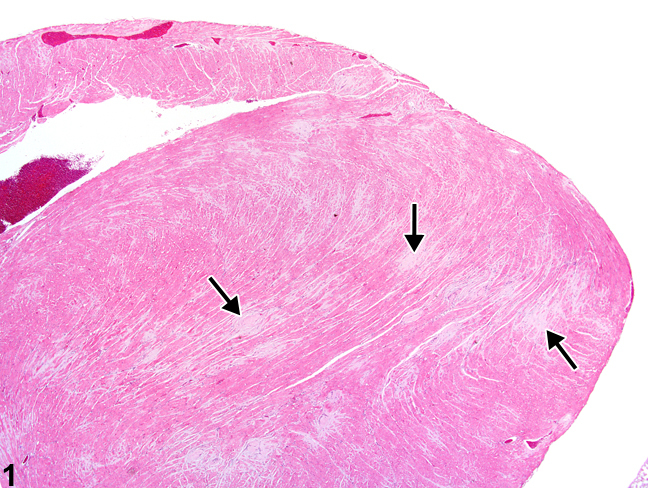 Heart - Amyloid in a male Swiss Webster mouse from a chronic study. 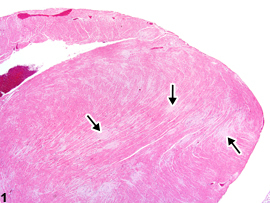 Multiple amyloid plaques (arrows) are present in the myocardium. 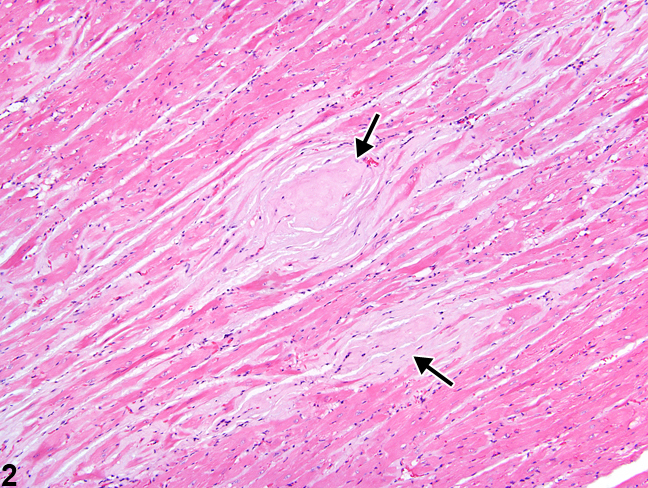 Heart - Amyloid in a male Swiss Webster mouse from a chronic study (higher magnification Figure 1). The amyloid (arrows) is composed of acellular, eosinophilic material. Heart - Amyloid in a male Swiss Webster mouse from a chronic study. 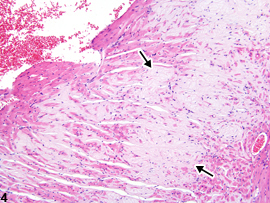 Multiple pale areas contain amyloid (arrows). 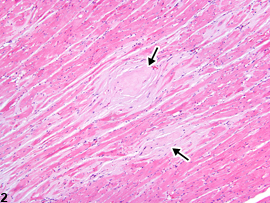 Heart - Amyloid in a male Swiss Webster mouse from a chronic study (higher magnification of Figure 3). 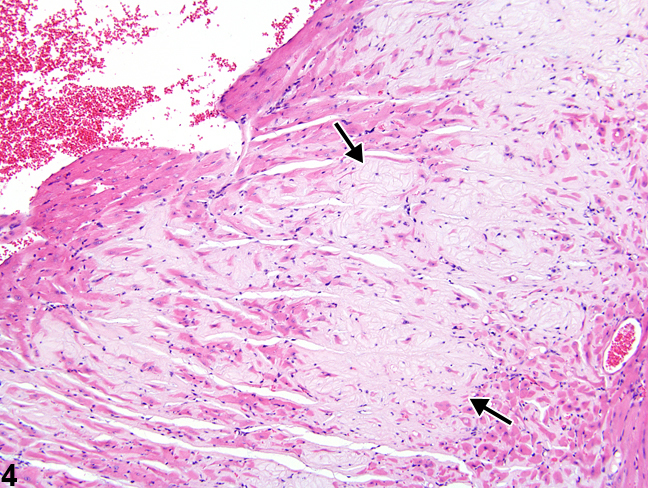 Coalescing areas of pale, eosinophilic, homogeneous amyloid are present (arrows). Amyloid (amyloidosis) is a systemic disease that is rare in B6C3F1, BALB/c, and C3H/HeJ mice and in rats but is common in CD-1, A, Swiss Webster, SJL, and C57BL/6 mice and can be a cause of death. The incidence can be increased in association with fighting among group-housed males and with ectoparasitism. The Swiss Webster mouse strain has been reported to exhibit a high incidence of cardiac amyloidosis, which is related to chronic dermatitis. Amyloid appears as an amorphous, eosinophilic, hyaline, extracellular substance ( Figure 1 , Figure 2 , Figure 3 , and Figure 4 ) that, with progressive accumulation, results in pressure atrophy of adjacent cells and tissue, leading to functional impairment. Congo red stains amyloid orange to orange red and under polarized light imparts a light green, so-called apple green, fluorescence. Heart - Amyloid should be diagnosed and graded based on the extent of deposition. Degeneration of cells secondary to amyloid deposition should not be diagnosed separately unless warranted by severity. If amyloid is present within the wall of a blood vessel, then the type of blood vessel (e.g., arerty, vein) should be included as a site modifier. If amyloid occurs in multiple sites,these may be listed in the narrative. The modifier "multiple" should not be used in the diagnosis. Rather, the total area affected by amyloid should be reflected in the severity grade. Bucher JR, Shackelford CC, Hasemen JK, Johnson JD, Kurtz PJ, Persing RL. 1994. Carcinogenicity studies of oxazepam in mice. Fund Appl Toxicol 23:280-297. Gruys E, Tooten PC, Kuijpers MH. 1996. Lung, ileum and heart are predilection sites for AApoAII amyloid deposition in CD-1 Swiss mice used for toxicity studies. Pulmonary amyloid indicates AApoAII. Lab Anim 30:28-34. Yoshizawa K, Kissling GE, Johnson JA, Clayton NP, Flagler ND, Nyska A. 2005. 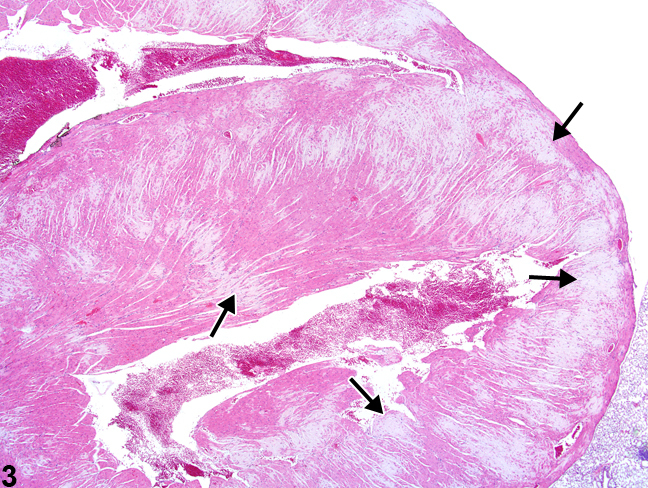 Chemical-induced atrial thrombosis in NTP rodent studies: Potential mechanisms and literature review. Toxicol Pathol 33:517-532.